What do your cats mean to you? Oh where to start… there was a Siamese in the house before I was born, so I never had to live without a cat. My baby blanket was finally taken from me when she died and she was buried with it – my mother knew me so well even at the age of five/six. She knew I could never say no to giving my most precious possession to Samantha Jane. And how clever of her to think of such a thing when she was so upset herself! I learned from all of the cats I’ve ever known – I even pick up physical habits from them. My cat Seymour used to nod his head upward from the chin several times when he was looking at something of interest in the distance, and I still do the same even though he’s been gone 20 years now. I catch myself trying to curl my tongue like a cat when I yawn. I can do an impression of an angry kitty that fools real cats, and have been attacked by a kitten for saying something truly offensive. A Siamese we had named Bambi wasn’t very friendly to me as a kid – she liked my mom best – but Bambi would always come and comfort me when I was crying, which I did a lot. She would also be my companion on midnight raids of the kitchen for milk and cookies, and I’d share both with her. She liked to lick the middle out of a sandwich cookie, and it has never occurred to me that letting a cat drink out of my milk glass is unsanitary. I’m never alone with a cat around. I always have someone to sit with, to talk to, to take care of, to play with, to cuddle. I know what they are thinking – when they are bothering to do any thinking – and I know when they are just happy to exist in a sunbeam. That’s a lesson I’ve learned, and well! My hubby tells people that I follow the sun around the garden like a cat. I like that I can tell when Spot has an itchy ear and is about to have a scratch, and how I know Lokii wants to curl up just there. They are never deliberately cruel, they are always ready to play, they look beautiful, their fur feels like the most luxurious material ever invented, and they even smell good! The smell thing came up for me a couple of times today, and I realised I’ve never mentioned that my cats smell great. Different from each other, too. Lokii smells like perfume, even though he has dandruff. Spot is less flowery but still smells…good. Clean, warm, cat-smell. My boys aren’t allowed outside, but I still remember from when I was a kid how the a cat smelled when she came in from outside, especially if she had been under a car – an interesting scent of hot cat and oil/gasoline. Cats require work, and sacrifice, and dedication, and responsibility. None of these are bad things. 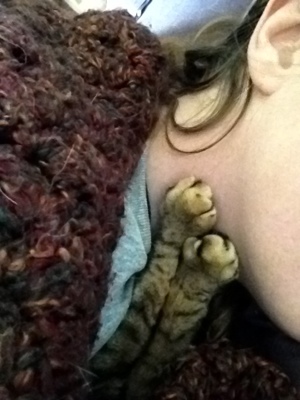 Spotty’s little feet on my neck as we nap on the couch. He always makes an effort and stretches out to put his feet on my face when he’s happy, warm, comfortable and sleepy. How I love him so. Never will I choose a life that is cat-less. My life would be smaller, diminished, without cats. Oh what a beautiful picture and testimony. You are right about all of it. The sweet fur smell, the companionship, the enchanting mannerisms (I yawn that way because of cats, too!). They are uncomplicated yet mysterious, and enjoy all the important things. They are my role models for relaxation and contemplation. And I have one on my porch tonight that came in from the thunderstorm from God knows where, after hanging in my yard for over a day to the excitement and delight of the antic Torvald. Who knows where this will end up? Antic: yes, that is the other thing. They know how to be funny without sacrificing an ounce of their dignity. Who of us can do that? I don’t think your pride (of cats) can take another member, it seems Torvald isn’t accepted quite yet? Unless a new kitty would be a buddy for him. That’s actually what I think might happen –they’re already entranced with each other, and she’s very young, and female, and comes from outside, so there wouldn’t be any motivation to attack him. She talks CONSTANTLY. Two pair can be easier than one pair and an unhappy odd man out, but man the vet expenses hurt to think about. Still, I can’t just toss her back out there. She’s tiny. Ah, just a baby? That’s hard. Is she a sweetie then? I’m such a sucker for a talkative cat – they really only talk to people, you know. Thanks for giving the time to answer Cats & Co’s question in such a full and delightful way. And I know what you mean with cats and their smell. Hiro, has this kind of smell, a good smell! He smells good! Glad you agree – since you inspired the post 🙂 I loooove kitty scent! I hit the “LOVE” not like button for this post, Spiders. LOVELY. Thank you! I probably could have kept going but it was dinner time 🙂 OH I just got reminded that I have a story to tell you all that will make you all so angry!